In this Photo Effects tutorial, we're going to learn how to highlight the main subject of a photo with a simple outline. Once we've added the outline itself, which we'll do using a couple of Photoshop's layer styles, we'll enhance the effect by boosting the color saturation of the main subject while decreasing saturation in the rest of the image, and we'll throw in a blur effect to further reduce the importance of the background. 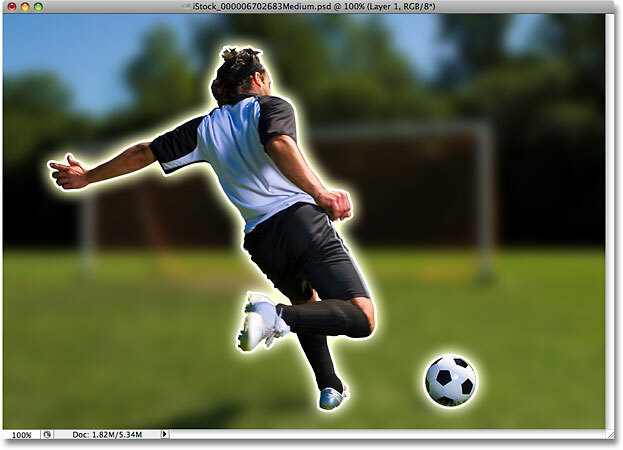 This photo effect works great with sports and action shots, which is where the idea for this tutorial came from, but you can use it with virtually any image. The Layers palette showing the original photo on the Background layer. Go to Layer > New > Layer via Copy, or press "Ctrl+J" (Win) / "Command+J (Mac)". A selection outline appears around the main subject(s) in the photo. For additional help with making selections in Photoshop, check out our Full Power Of Basic Selections tutorial, which you'll find in the Photo Editing section of the website. The main subject now appears on its own layer in the Layers palette. Click on the Layer Styles icon and choose Stroke from the bottom of the list. 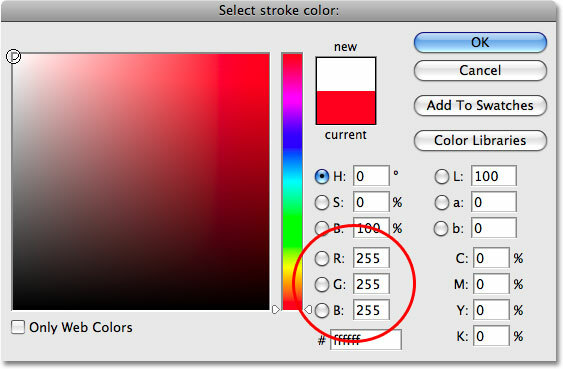 Click on the color swatch to change the stroke color. Adjust the size of the stroke with the Size slider. A white stroke now appears around the main subject(s) in the photo. Click directly on the words "Outer Glow" on the left of the Layer Style dialog box. The Outer Glow options in the Layer Style dialog box. The outline effect now includes an outer glow. Click OK to exit out of the Layer Style dialog box at this point. We're done applying our layer styles. 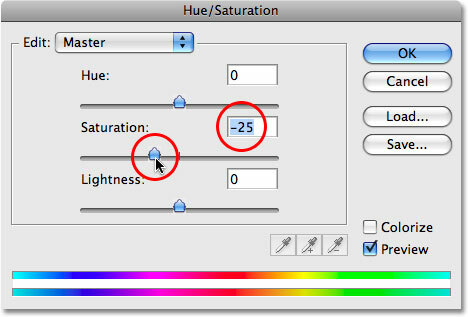 Hold down "Alt" (Win) / "Option" (Mac), click on the New Adjustment Layer icon, and select "Hue/Saturation" from the list. Select the "Use Previous Layer To Create Clipping Mask" option. Drag the Saturation slider to the right to boost color saturation in the main subject. The Layers palette showing the Hue/Saturation adjustment layer clipped to "Layer 2" below it. The color saturation of the main subject has been increased without affecting the rest of the photo. 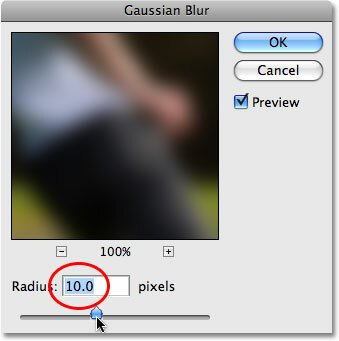 Step 7: Apply The "Gaussian Blur" Filter To "Layer 1"
The rest of the photo is now blurred while the main subject remains untouched. 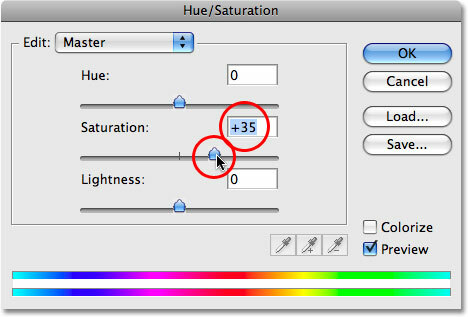 Step 8: Reduce The Color Saturation Of The Background With "Hue/Saturation"
Select another Hue/Saturation adjustment layer from the Layers palette. Drag the Saturation slider to the left to lower the color saturation of the background. And there we have it! That's how to add an outline effect to the subject of your image with Photoshop! Visit our Photo Effects section for more Photoshop effects tutorials!